Great host facility, informative and entertaining - A bit rustic ride over the island, still scenic - Wonderful stories and most of all, the oil! Still enjoying oil and the special Governor's bottle! This was the best tour of our whole trip. We only had a few hours in Corfu and this took up all of the time but I still say Corfu was one of my favorite stops. George is knowledgeable, passionate and funny about olive oil, the history of Corfu and the current affairs of the area. The tasting was delicious with the added bonus of extras made by mother then we got to meet mother and other members of the family. If I ever make it back to Corfu I will be taking this tour to The Governor again. I can't say enough about how terrific this tour was. 6 members of our group attended this small group tour, led by George. The personal details that he gave us about his family, the history of the Governor Olive Mill, and information about the production of olive oil was unlike any tour I have ever taken. 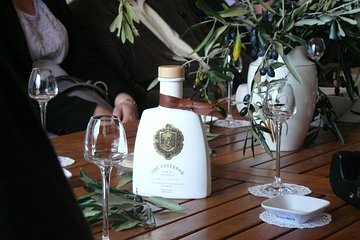 My husband and I appreciated the personal touches he provided we were stunned to learn that the delicious foods we enjoyed during our olive oil tasting were prepared for us by his Mother. We were touched and thrilled to have the opportunity to meet and thank her personally - and felt honored to have met his grandfather as well. This was the highlight of a 3 week vacation that included many tours and locations around Europe, and one that we would recommend to anyone who visits this area. I can't imagine anyone doing a better job or giving a more complete and enjoyable experience than George! This was an incredible tour. The Governor Olive Mill is an amazing family run operation. The tour guide George and his entire family was so friendly, warm, and knowledgeable. He picked us up from our port and spent the entire day showing us the mill, tasting, learning, and touring all around Corfu including a castle! and he had us back to our boat on time. I cannot recommend this tour enough!!! Worth every penny and more! Such an enjoyable day. George is so passionate and knowledgeable about Olive Oil. Highly recommend this excursion. Although it says 4 hours George was so generous with his time that it turned into a full day. Pick up from hotel at 9am and returned after 4. Our visit was some 5 weeks ago now but was certainly a highlight of our holiday and we are still enjoying our Governor Olive oil on our salads. Thank you so much George. Amazing experience and great vision for the future on how olive oil will be used as a form of medicine. Highly suggest taking this tour! The Dafnis family is great and this experience was the highlight of our trip to Corfu. It's a must! Fantastic, this was one of the highlights of our two weeks trip. George and his brothers were terrific. He was waiting for us as promised, We drove up to their farm where we ate and drank and learned all about olive oil - including how to taste it and how to use it to stave off Alzheimer's. This is a terrific change from the usual tour. It was very relaxed way to spend the morning we highly recommend it. This was an amazing tour with a great presentation on Olive oil, its benefits and the processing of olives. This was one of the best high lights to our 21 day cruise and I would highly recommend it if you on Corfu Greece. George and his family are passionate about their family business and are taking the olive industry to new heights. George and his entire family were fantastic! Thank you for a wonderful look into your beautiful family business. I hope we can come back to Corfu to visit you again. George was funny, full of energy, and information. Best excursion we've ever done.